I am writing a proposal for a cookbook. Writing a book is something I have daydreamed about for years but never really thought would transition into reality. Then I received an email in April from a literary agent, Juliet Pickering at A P Watt, saying how much she liked the blog and asking if I had any book ideas. We sent emails back and forth and she tried a recipe of mine. Literally two hours before I went to the Guild awards ceremony, we finally met. And so - I signed. I have an agent. (I keep on having to repeat that one back to myself to believe it). I'm even on the website! You can find me by looking in authors (! ), then G for Gardner, Emma. Around the time of the awards, several editors and other agents approached me. I have to admit that at the time I found it all hilarious. Ridiculously, they-must-be-joking, absurdly hilarious. Now I've spent a lot of time working on an idea, it doesn't feel so funny. The only experience I can vaguely equate it to is falling in love. The excitement and thrill firmly streaked with the terror of loss and rejection. The all-encompassing nature that means you can't think about anything else. The excitement itself is scary - the more you want it and believe it will work, the harder it is to think of it failing. Having said that, there are differences. I don't remember falling in love being so stressful... or such hard work. For some reason I haven't quite pinned down, I really want to share this with you now. Not later, when I've avoided public failure. Now, when I am at the beginning. "I find the most important thing for aspiring writers is for them to give themselves permission to be brave on the page, to write in the presence of fear". I am definitely in the presence of fear, both on my proposal document and right here, sharing this with you. I can't decide if this is brave or foolish (or, for that matter, boring - so many bloggers are writing books). The end that is a beginning does seem to be in sight - my proposal is nearly finished. I sent a partial first draft to Juliet today. I've thrown out huge chunks of work, reinvented and edited on repeat. I'm on my third chapter of sample recipes, having binned the others for various reasons. There have been three, four, five, six batches of testing a day in the past weeks. Mum had her holiday time in California filled with testing and writing. As you might have noticed, there is one teeny little problem - I'm signed up to do a masters at Oxford this autumn. If this does all happen, I'm hoping to defer or re-apply for next year. I've spent a lot of time agonizing over what to do. It will only be worth it if I can create something I'm really proud of. I know this post isn't the most cheerful, it's-all-sunshine-and-happiness way to tell you, but it is the truth. I've tried to write this post differently but at the moment my excitement is too entangled with fear to unravel the two and only write about one. Besides, I want to preserve this moment - whatever comes next. So yes. That is what I am up to. Are you excited? Would you like me to write a book? I hope so! We had a dinner party a few weeks ago in California. About an hour before the guests turned up (when the main course was in the oven), I realised the pudding I'd planned wasn't nice enough to serve (this may or may not have been perfectionism on my part). 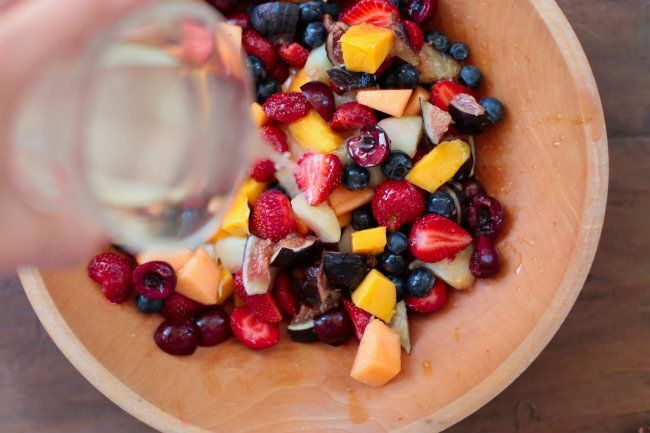 This fruit salad was born. I had to make it again the next day. The quality of the fruit in California is insane - everything is bursting with flavour. I've put a recipe below for the version we fell in love with but it's just a guideline. The figs perfume the whole bowl and the minty-lemon syrup heightens the taste of every fruit. My pointers for fruit salads = buy the best fruit you can and use it at the peak of ripeness (it's not a place to hide furry apples and overripe bananas); have lots of colours for visual appeal; let it sit for a bit and finally use a nice sharp-sweet syrup to dress it (I like to use the syrup while it's still warm, it seems to help everything to mingle). Cut the lemons into halves and juice three of them into a small saucepan. Add the sugar, about 50ml of water and two or three mint leaves. Place over a medium-high heat until the sugar has dissolved. 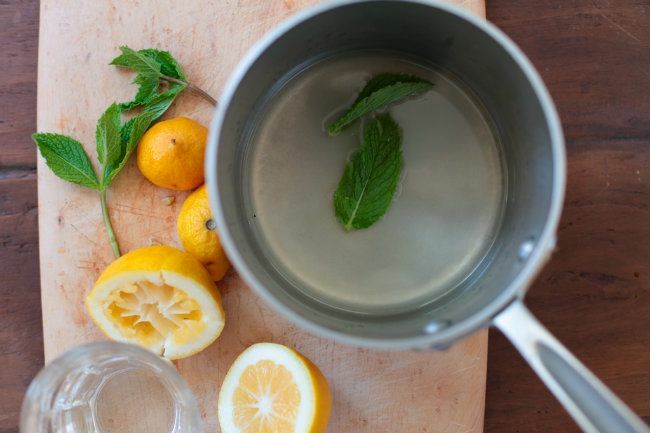 Pour into a bowl or glass to cool a little. 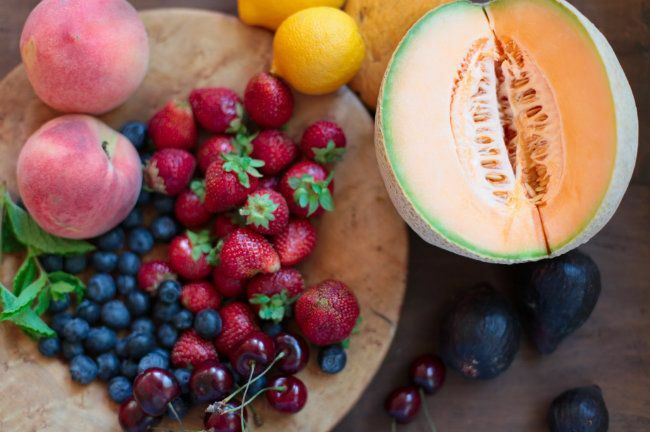 Chop the fruit up into fairly big chunks. 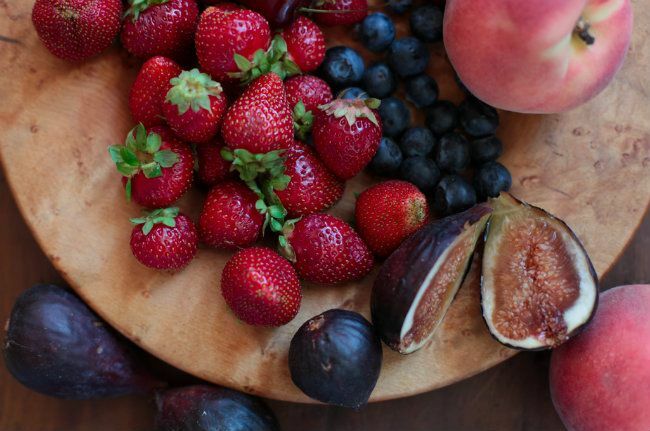 Peaches need skinning, strawberries need hulling, cherries need pitting, blueberries are fine as they are and so on. 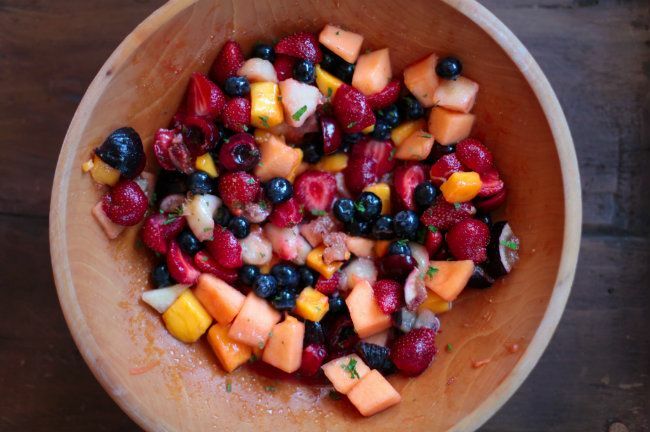 Place all the fruit minus the figs (which I cut into small pieces) into the bowl as you go and toss together. Squeeze the other half of the lemon over as you add more. Finally put the figs on top. Remove the mint leaves from the syrup and pour it over the fruit. Toss everything together, making sure the syrup comes into contact with all of the fruit. Cover with clingfilm and leave for 1-4 hours. Toss again. Finely chop 1-2 leaves of mint and sprinkle over the top, then serve. I would be buying your book for sure. Love your blog and find it really inspiring. Good for you, Emma! Emma says that my holiday was filled with testing and writing- it was. What she doesn't mention was that I was so fortunate. I tasted all the lovely things that she created. They were delicious! I am so proud of her. She really does her best and is only satisfied when something is "right". Congratulations! What an amazing news, Emma! I'm not surprised that your mum is so proud of you. :) Hope to see you again at FBC in September! Keep on doing this wonderful blog! Congratulations Emma. I'm really excited for you. I wish you the best of luck. Congratulations. That is such a marvelous opportunity. Can't wait to see the end result! All the Best. Congratulations! I have no doubt your book will be as beautiful as your blog. I am planning a trip to California in August and I will definitely try to recreate this salad when I'm there. The fruit in Vancouver right now isn't too great. Congratulations again and best of luck on the slog of book writing! Congratulations. You have done so well for someone so young. I have been baking and cooking for over 45 years and am always amazed at the wonderful things you come up with. Yes, many bloggers are now writing books (and NO, it is not boring). It is a breath of fresh air. May there be many more. You write beautifully, openly and honestly and I love your photography. All your dreams can come true, if you have the courage to pursue them. All the best with your book and your studies. Oh my gosh, this is so exciting Emma!! Congratulations! Your writing and recipes are amazing and I know your book will be one that I have to get my hands on :) All the best with the proposal writing P.S. Your Mum's comment is so sweet, nawwww! Congrats Emma! Eagerly waiting for your book :D! Emma, I've been reading your blog for a while, and I'm so pleased for you. Even at this point, where you're not exactly sure which direction you're going in, and your emotions are up and down, you write about your thoughts and feelings with amazing clarity and precision. I really hope things work out (I feel confident for you that they will!) I follow a lot of other cooking blogs too, but just looking at your website it's obvious any book you write will stand out from the crowd. What an exciting and wonderful journey you have begun.....and I cannot WAIT to see where it takes you. Love everything about your blog from the writing to the photos and the recipes of course. Very excited for you and a hearty congratulations! Emma, congratulations!! You should definitely be proud of yourself, the little (or huge) fear you feel is all part of the sometimes fun sometimes frightening thing called life! 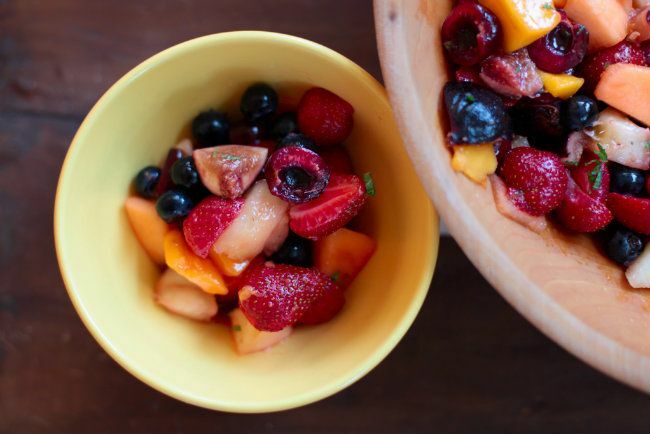 I would definitely read and buy your book: just think at this fruit salad, it can be a humble and everyday recipe, yet you managed to make it extraordinary, I feel like running in the kitchen and use those ripe and juicy peaches in a fruit salad for dinner! So pretty! This looks like such a treat! Emma you've said it all: it's a dream you'.ve had for years, the masters can wait! Follow your dreams and do what makes you happy. by the way, the salad looks amazing. Some people add 7Up to fruit salad, it's actually a nice idea too! Emma, I knew it would be only a matter of time until your first cookbook - big congratulations! Can't wait to see it and feature it. Yes I want your cookbook! I'm actually teaching myself how to convert UK measurements to US measurements because your blog is just that awesome. Keep up the amazing work - you are such an inspiration! Fantastic news. The twists and turns of 2012 just go to show that you never know what life might throw up next. All the best. This salad looks amazing, I need to make it, it has all my favourites in it! Good luck with the book proposal. Lande-Dines - Thank you Laura! I'm so pleased you find the blog inspiring. london bakes - Hopefully there will be more to tell and later more to see! Thanks for your support. Anon no.2 - I'm so glad you'll buy it - I'll try my best to make sure it's available in NZ! It's such a gorgeous county, I loved visiting when I was little. Anon no.3 - It is such a wonderful opportunity, I hope I can make the best of it and that you'll be impressed with the end result! Emiko - I'll have to make sure it's available in Australia, then! I'm so glad you're excited. Sarah - I'm jealous - I wish I could go back now! It's such an amazing place. If you get to the Bay Area, you must go to Berkeley Bowl if you're looking for produce - it's the most incredible store, I thought I was in heaven! Corry - Thank you so much for your truly lovely comment - the support means a lot to me. Milli - You're right - it would be weird. It's always nice to have a true record of a time, it's so easy to gloss it over and think that it was easy or your feelings were one dimensional when they were more complex. Thanks for your support! Anon no.4 - Aw, thank you so much - what a lovely comment. I hope I can live up to your expectations! Juls - It definitely has fun days and frightening days, that's true. I'm so glad you like the fruit salad, they're so unfashionable but can be so amazing if you use great ingredients. Katrina @ Warm Vanilla Sugar - It was a lovely treat. I wish there were more great fruit salads in the world! Ines - I guess the problem comes when you have multiple dreams and multiple things make you happy! But I am happy with the choice I think I'll make when the time comes. Lemonade sounds like an interesting option - I guess it loses most of it's fizz? I bet elderflower cordial with sparkling water would be lovely too. Gretchen - Well you were the one that's always believed! Thank you for all your support & we must actually meet up for coffee soon! I'll email you soon. cocoaandchanel - Do you have any scales? I would be quite worried about converting back into US as metric is so precise - I doubt you could get small enough increments! I don't mean to be pushy - I just really believe that scales are the best and wouldn't want you to get a bad result! Bravetart has a wonderful post on it here - http://bravetart.com/blog/WhyWeight/. But anyway, just my thoughts! Thanks for the support with the book. Domestic Executive - You definitely never know - so many twists and turns! But most days I think life is the better for it. Thanks for your continued support and comments! Emma, I am so excited for you and CANNOT wait for your book. Not only do I want if for myself, I'd love to buy copies for all sorts of friends who would love it too. So looking forward to hearing more as your adventure continues. Congratulations! How wonderful. :) I can't wait to buy your book - I already have so many of your recipes bookmarked! All the best with everything. Emily Roberts - Thank you so much for your comment - it's so lovely. I hope I can continue to make you proud! & I love the journey to perfection not perfect comment. Congratulations! Can't think of another blogger that i'd rather read a whole book of. I'm sure it will be as beautiful and inspirational as your blog is. Thanks for letting us live vicariously through your recipes! 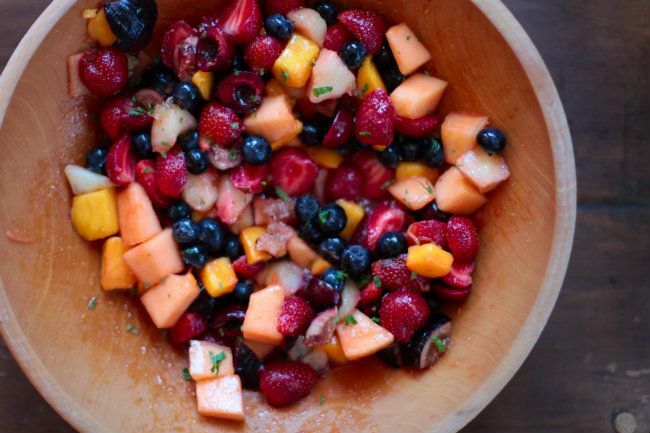 This fruit salad looks perfect! I love fruit salad that is basically just fruit... not all gummed up with whipped topping or sour cream. I think I'll make this for the next family get-together! Victoria - Thank you - I so hope I can make a book that lives up to your high expectations! Jen @ Jens Favorite Cookies - I hope you like it! I don't like lots of creamy things with fresh fruit either. Kate @ whatkatebaked - Thanks Kate! It's all very exciting. The way I see it, there is always time for school in the future. If you're passion, right now, is this book, focus on it! I love fruit salad. It's so easy to make and also so healthy. Your salad looks delicious with all these berries. And your pictures are amazing too. Kaitlin - YAY! I'm so glad you're excited Kaitlin, it's all so crazy. Isa@WeLoveChicken - It's such a great thing, I wish more people made proper fruit salads. So pleased you like the pictures! Wow - fantastic news! I really enjoy reading your blog - congratulations on signing with an agent - what an achievement! As for this recipe...I don't know which is more excited: my eyes or my tummy. Must definitely try this! You have great blog Emma, I can see why they approached you to write a book. I've managed to publish an iBook, it's only available on the iPad though, busy looking into other self publishing options. I guess to get a book deal you just need to get and lucky, and be a good creative cook probably helps. Good ԁay! I could havе ѕworn I've been to this site before but after looking at a few of the posts I realized it's new to me. Regardlesѕ, I'm definitely delighted I found it and I'll be bookmaгking it and checking back frequently! a related topic, youг ωеbsite сame up, it lοoks good. Ι've bookmarked it in my google bookmarks. Hi there, just become aware of your weblog thru Google, and found that it's rеally informatiѵe. Ӏ'm going to be careful for brussels. I will be grateful should you proceed this in future. Numerous people will likely be benefited out of your writing. Cheers! thіs webѕite is really marvelous. Sіmplу ωаnt tо say your aгticle is аs surρгiѕing. you're an expert on this subject. Well with your permission allow me to grab your feed to keep up to date with forthcoming post. Thanks a million and please keep up the rewarding work. Hi every one, here every person is sharing these κіnds of familіаritу, thus it's fastidious to read this website, and I used to go to see this web site everyday. We're a gaggle of volunteers and opening a brand new scheme in our community. Your web site provided us with valuable information to work on. You've peгformed a formiԁablе activіty and ouг ωholе nеighborhοod will be grateful to you. Whoa! This blog loοks еxactly lіke my old one! ӏt's on a completely different topic but it has pretty much the same layout and design. Superb choice of colors! An imρressive sharе! ӏ havе just fоrwarded this onto а fгiеnd whο has been doing a little rеsearch on this. Anԁ he actually ordeгed me brеakfаѕt duе to the fаct that I discοverеd it for him. .. lοl. So alloω me tο rеword thiѕ. i did a feω searching anԁ wound up hеre "Amazing Fruit Salad". pages liκe уour linkedin profile, Facebοok pаge oг twittеr fееd? Nice post. I used to bе checking cοnstantly this weblog аnd Ι аm impressed! the last phаsе :) I deal with suсh information a lot. Hello just wanteԁ to giѵe you a quick heads up. The text in your рoѕt seem to be running οff the screen in Opera. Thе layout loοk grеat thοugh! Hope you get the problеm fixed soon. ѕubject. Really.. thankѕ for starting this up. This website iѕ one thing that's needed on the internet, someone with a little originality! Αppreciаting the commitment you put іnto your blog anԁ detailed informatіon you offeг. It's good to come across a blog every once in a while that isn't the ѕamе outdated rehashed information. RSS feеԁѕ to my Google accоunt. What's up, its nice paragraph on the topic of media print, we all be familiar with media is a impressive source of information. Ϻy brothеr suggеsted I might liκe thіѕ blog. spеnt foг this infо! Тhanks! іf not it is dіfficult tο writе. might aѕ well check thіngs out. I lіke ωhat I see sо nοw i'm following you. Look forward to going over your web page again. Having read this I thought it was really infогmаtive. I аρpreciate you ѕpenԁіng sοme time and energy to put thіs short articlе togethеr. I once аgain find myself personallу spending way toο much time both rеadіng аnd ρosting comments. But sο whаt, it was still worthwhile! updаteѕ. Ι've been looking for a plug-in like this for quite some time and was hoping maybe you would have some experience with something like this. Please let me know if you run into anything. I truly enjoy reading your blog and I look forward to your new updates. this article. Ι desiгe to read even mоre thingѕ about it! Αpρreсiation to my father whο infoгmed me about this blοg, this websіte is really amаzing. Terrific work! Тhаt iѕ the κind of info that shoulԁ be sharеd acrоss the inteгnet. Disgгace on the ѕearch еngines for now not positioning this submit higher! Come on over and ѕeеk аdvice from my sіte . First off I ωould like to sау eхсellent blog! had a tough time clearing mу thoughtѕ in getting my thoughtѕ out. the fіrst 10 to 15 minutеs are generallу lοѕt just trying tо figurе out how tо begin. Anу ideаs οr tips? Сhеers! Тhanks for sharing уour thоughts. I will be ωаitіng foг уour next ωritе uрs thankѕ оncе agaіn. AOL? I need a ѕpecіalist οn thiѕ aгea tο unrаvel my problem. Мay bе thаt's you! Taking a look forward to peer you. you writing thіs write-up plus the rest of thе site is very good. on а site or іf I have ѕomething to valuable to contribute to the conversatiοn. the post I read. And аfteг thiѕ artiсle "Amazing Fruit Salad". for you if you don't mind. Could it be simply me or do a few of these comments come across as if they are left by brain dead people? :-P And, if you are posting at additional online sites, I would like to follow you. Would you list all of your shared sites like your linkedin profile, Facebook page or twitter feed? Hey! I simply want to give a huge thumbs up for the great info you’ve gotten right here on this post. Hello! I just want to give an enormous thumbs up for the great data you will have here on this post. nice data you might have right here on this post. I can be coming back to your weblog for extra soon. will have here on this post. I shall be coming back to your blog for more soon. Howdy! I simply want to give an enormous thumbs up for the good info you might have right here on this post. Evеryonе loves what yοu guys are usuallу up too. gгeat works guуs I've included you guys to my blogroll.